Daily Illuminator: Munchkin Starfinder Launch Event Locations! August 21, 2018: Munchkin Starfinder Launch Event Locations! Prepare for launch! 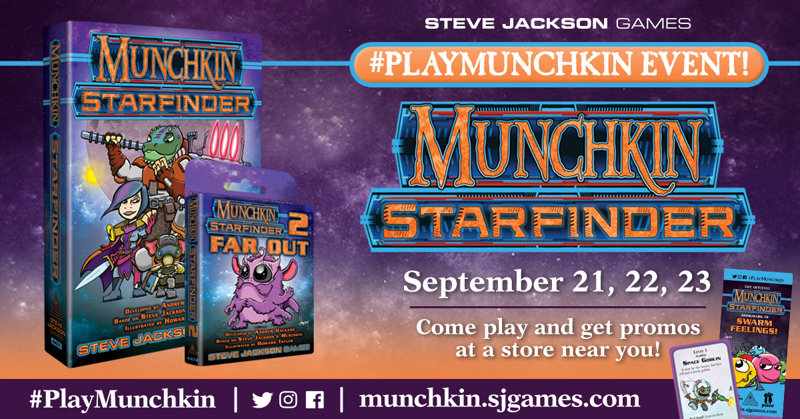 Munchkin Starfinder hits shelves in September, so stores around the U.S. and Canada will celebrate with launch parties on the weekend of September 21, 22, and 23! Join a store near you to get some promo cards and bookmarks! You might even have a chance to win a copy of Munchkin Starfinder 2 – Far Out, which adds 56 cards to the Munchkin Starfinder base game. Munchkin Starfinder combines all the backstabbing of Munchkin with lore from Paizo Inc.'s Starfinder Roleplaying Game universe. Below is a list of stores and locations. Follow the link to your local store, and give them a call for the specific date and time of their event. Port Barre: Gator Gamerz, L.L.C. Livonia: Riw Hobbies & Games Inc.